Getting stranded on the side of the highway stinks, but if you’re prepared for it, it can stink a little less. 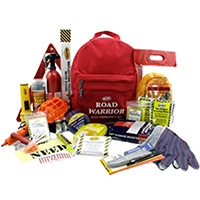 By packing just a few essential tools and supplies, you can become your very own roadside hero. Or if you’re not the hero type, you can at least make your side-of-the-road stay a little more comfortable until help arrives. 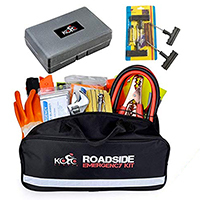 Putting together your own kit can be a hassle, so we’ve selected the top auto emergency kits to help you stay safer both on—and accidentally off—the road. 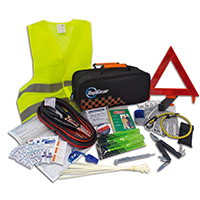 With a decent assortment of higher-quality supplies than many of the kits we researched, the Top Gear kit gets our top pick for best emergency car kits. The high visibility reflective safety vest, warning triangle, and 12-hour light sticks are designed to keep you safe while you work on your vehicle. The LED flashlight works with a hand squeeze pump, so you never have to worry about keeping fresh batteries on hand. The first-aid kit has only the basics, and there’s no air compressor, but there’s plenty of room in the kit’s sturdy carrying case to add more equipment. At just $40, this emergency kit also won’t break the bank. And if you’re a fan of the Top Gear show, you’ll like the decal of The Stig character that’s included. If the name is any indication, the manufacturers of this emergency kit think it’s pretty amazing, and we agree. But its all-inclusiveness comes with a triple-digit price that knocks its hero status down a notch. 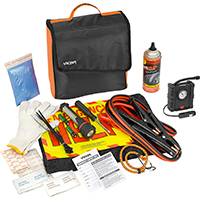 Still, with cold weather supplies like hand warmers, fire starters, and an ice scraper, this kit is great if you live in a chilly climate where you could get stranded in a winter storm. It also includes emergency food and water so you don’t have to starve if you get stuck. We also like the little extras like a pen, notepad, gallon storage bags, and a first aid manual. The manufacturer offers a lifetime warranty against defects, and several Amazon reviews mentioned fantastic customer service from the company. If you’re not ready to fork out serious cash for your emergency kit, the Victor Covered offers the key basics for around $50. If you get a flat tire, the tire sealant can patch it in a hurry, and the air compressor can get you rolling in no time. The rain poncho will keep you dry in wet weather, and the included blanket is actual fabric (not Mylar) and can warm you up or help with first aid. The flashlight does require batteries, but they’re included with the kit. We like that Thrive’s first aid kit comes in a separate pouch, so it’s easy to pull out for minor cuts and scrapes. The first-aid kit also includes scissors, tweezers, pins, and burn gel, which aren’t often included in more basic kits. The socket wrench is another unique feature of the Thrive kit, along with a razorblade knife. 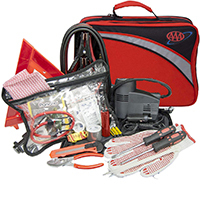 Its compact size makes it good for small vehicles, but we definitely found quality lacking in this kit, especially the tools. The Mayday Urban Road Warrior may not fight your battles for you, but it is well-equipped to help you fight them yourself. The Mayday has an aerosol tire repair spray to fix a flat tire and an auto spotlight to help you see what you’re doing. The kit also comes with a full-fledged fire extinguisher and some emergency drinking water in case you get thirsty while you’re warrior-ing. The backpack design makes it easy to carry and great for travel. Unlike other kits that claim 50 items when 25 of them are bandages, the Performance Tool kit comes clean with the claim of “49 pieces with an assortment of 15 items,” so it gets high marks for honesty. This kit may be small, but it’s mighty when it comes to repairs: it includes jumper cables, split joint pliers, electrical tape, a tow rope, and a snap blade knife. On the downside, it’s pretty bare bones when it comes to survival equipment, so you should add in other basics like a blanket, reflective gear, and some extra food and water. Whether you need first aid, an adjustable wrench, a tire repair kit, or a safety vest, the Kolo has all your bases covered with its widely assorted 156 pieces. We like that the tools come in their own hard carrying case inside the kit, and the combination seatbelt cutter/window breaker is a great extra. There’s a tire pressure gauge and a tire repair kit, but no air compressor. The Lifeline isn’t as loaded as many of the higher-end kits, but what it does, it does well. It has both an air compressor and 8-gauge jumper cables, along with screwdrivers, pliers, duct tape, and a utility knife. 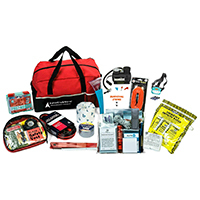 We recommend rounding out this kit with some survival gear like food, water, and a Mylar blanket. Why do most emergency kits come with such low-quality items? A Mylar blanket is a good representative of the kinds of items you’d find in an emergency kit: you’d probably never put it on your bed as an actual blanket, but it’s lightweight, cheap, easy to carry, and serves its purpose as a one-time-use item in a pinch. Similarly, in most vehicle emergency kits you’ll find screwdrivers, flashlights, and other tools that probably aren’t robust enough for you to keep in your toolbox for regular use, but they’re cheap and they’ll work in an emergency situation. If you want higher-quality items, you’ll probably want to spend the time and money to put together your own kit. 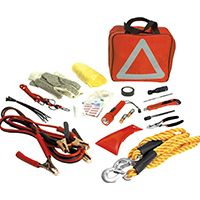 Where should I store my car emergency kit? I’ve heard it’s dangerous to keep bottled water in the car because of temperature changes. Is that true? It depends. Most plastic water bottles contain BPA, which is a chemical that can leach into the water in the bottle if it’s exposed to high temperatures. On a sunny day, the inside of your car can quickly reach temperatures anywhere from 30–50 degrees hotter than the outside air temperature. Using other non-BPA bottles might be safer, but if they’re clear, you run the risk of sunlight causing bacteria and mold growth. One report by CBS News suggests another danger: water inside a clear bottle can act as a magnifying glass and start a fire. We recommend using aluminum bottles, canned water, or emergency water pouches for car water storage. What do the gauge numbers on jumper cables mean? “Gauge” refers to the thickness of metal. The higher the gauge, the thinner the metal. When it comes to jumper cables, the lower the gauge, the thicker the wire. You want a lower gauge for jumper cables because thicker wire conducts electricity better than thinner wire, and it’s less likely to break. Wire that is 16-gauge is thinner than a coat hanger you get from your dry cleaner, whereas you’re nearing “bolt-cutter required” territory with 8-gauge wire. What other items should I consider for vehicle safety when I’m on the road? Backup cameras can help you avoid a tragic rollover—or just a dented fender. GPS navigation systems give you hands-free, turn-by-turn directions so you don’t have to drive distracted when you’re trying to go somewhere new. If you do have the bad luck of getting into an accident, a dash cam can be your eyewitness account and potentially save you a lot of time and hassle with law enforcement and your insurance agency. Whether you consider yourself a road warrior or you just occasionally like to go out for a nice Sunday drive (does anyone take Sunday drives anymore?) a well-stocked emergency kit can give you the satisfaction of knowing you’re prepared for the worst so you can sit back, relax, and enjoy the best. Check out our auto safety resources for more tips on how to keep you and your family safer out on the road. 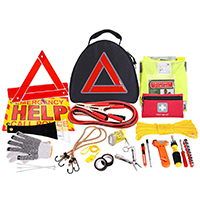 To find the best car emergency kits, we compared the contents of a variety of different kits to discover which products stood out from the rest. We scoured reviews to see what kit users said about how well the products were made and how they performed. To learn more about how we review and rank products, check out our methodology.